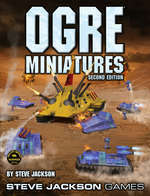 Daily Illuminator: Preorder Ogre Miniatures Today! May 12, 2018: Preorder Ogre Miniatures Today! Now that Ogre Miniatures Set 1 is in stores, the Ogre Battle Box is in the final stages of assembly at the factory, and the Ogre Miniatures, Second Edition rules have met the funding goal on Kickstarter, we have opened preorders for Ogre fans outside the U.S. who wish to get their hands on the upcoming hardcover rulebook. This 64-page book is the newest edition of the ruleset first published in 1993, and the new book - along with the miniatures packed inside the Ogre Battle Box - give you all* you need to transport the classic Ogre wargame from hex maps to attractive, miniatures tabletop battles. * Well, all but terrain. You'll need to devise your own miniatures terrain. Sorry about that. Maybe we should produce some wargaming terrain for use with the Ogre Miniatures rules.